Throughout Thai history, the elderly have been regarded as a pillar of the community. But times change, and now, the elderly are often treated as a burden to society, thrown away, forgotten. Ruth Center won’t forget them. Begun in 2008, Ruth Center’s heart goal is to work with slum communities in Bangkok to improve the quality of life for the elderly and seek long term solutions to their care. In Bangkok alone, there are over 940,000 elderly, many destitute, lonely, without family or anyone to help them. With her husband dead, and abandoned by her only daughter, Mother Mee doesn’t have anyone to lean on. Tears are a part of almost every day. Though born in Thailand, she doesn’t have an ID Card so she can’t even get the Government $1 Health Care Card. She lives in a roofless jumble of boards and sticks in a slum. One day she picked up plastic someone threw away and used that for her roof, but her little hovel still had no walls. For a bed, she sleeps on a board with one thin old blanket to keep warm. When rain come, she always gets wet. Sometimes snakes and centipedes come to her shack thinking it is their home too. To earn enough money for a little food, Mother Mee forces her aching 75 year old body out on the roads and footpaths, looking for garbage she can resell. Some days she has food. Some days she doesn’t. Mother Mee knows what hunger feels like. It is her daily companion, along with her tears. That’s when Ruth Center found her. Working with the slum community Mother Mee lived in, Ruth Center’s caring staff, along with a team of volunteers, built a basic shelter for Mother Mee. (see right) It’s the first time in years Mother Mee has felt cared for, loved, not alone. Ruth Center is providing basic food for her, and helping her to get a government ID card. Ruth Center can’t everyone, but they help the next one, and the next one, and the next one. Because that’s what L.I.F.E. is all about. 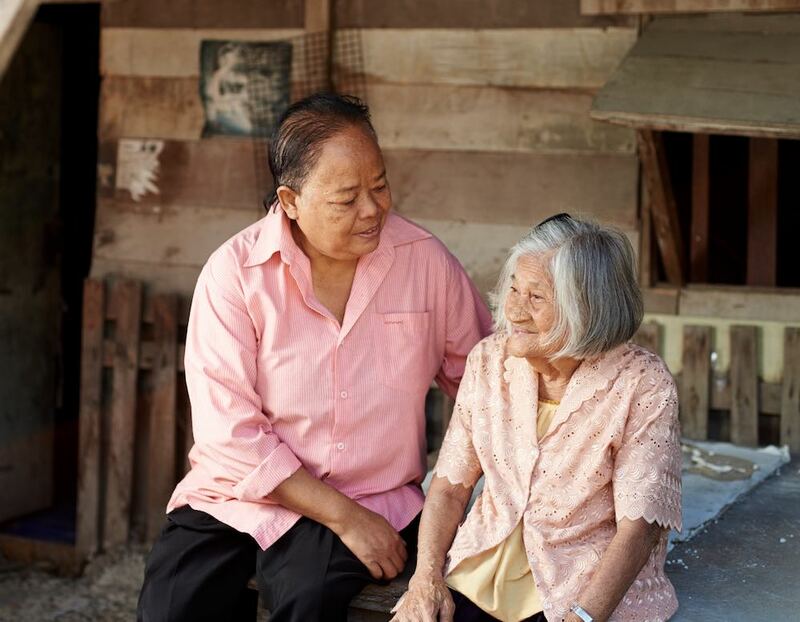 The Ruth Center consistently helps 452 elderly people in 15 communities in Prawet District. Ruth Center staff regularly visit them, giving them basic necessities and much love. Special activities are organized for them, such as taking them on a trip to the park four times a year and an annual special trip to the beach. Caring for the elderly also means lots of practical help, such as construction projects to help fix roofs, sidewalks, bathrooms, floors and other parts of their homes. Many of them help care for their grandchildren, so another practical way we help is by organizing activities for the children during school holidays, to give their grandparents a break and time to rest. One of the goals in working with these communities is to help them care for themselves. We regularly help the elderly clean up trash within their neighborhoods. We also want to help the elderly generate an income. We do so through the Dream Project, a program where the elderly help to sew and create products which we then sell for them. Please don't write anything else on the check and include a separate note indicating that your donation is for "Project 3061, Ruth Center". "YWAM Project Funding Office, PO Box 57100, Vancouver, BC V5K 1Z0, Canada". Please do not write anything else on the check but include a separate note indicating that your donation is for "Ruth Center".